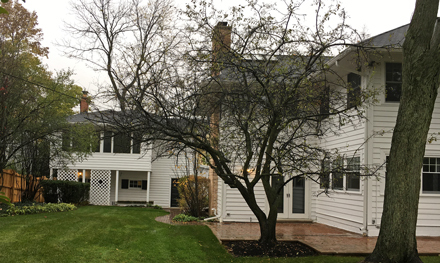 The main Veeck family home (foreground) and the coach house that contained Bill Veeck’s first apartment stand on an attractive corner lot in Hinsdale. The white frame Colonial-style house with an attendant garage-coach house, breathing easy on a corner lot on tony Hinsdale, seems modest by the mansion-size housing in every direction. But the two structures stand tall, above everything else in the neighborhood, with their historical value. Chicago’s baseball timeline coursed through this home in the first four decades of the 20th century. The structures, saved from the wrecking ball recently, were the home of two generations of baseball Veecks – dynamic Cubs President William L. Veeck, Sr. and his active, tousled-haired son Bill, later the Baseball Barnum and two-time White Sox owner. Re-purchased by the Veeck family for $1.35 million and now up for sale again with the proviso the structures not be replaced by a “McMansion,” the structures are enmeshed in history, then and now. So many baseball ideas and decisions were mulled over in the more genteel life between the world wars in the comfy homes. Several celebrity dinner guests like Hall of Fame manager John McGraw visited, and likely enjoyed officially Prohibition-barred “hospitality” on the screened-off front porch after finishing dessert. A close-up of the coach house converted from servants’ quarters to Bill Veeck’s newlywed apartment. 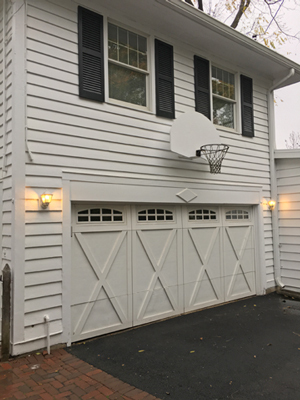 He’d have appreciated the basketball hoop on the top of the garage. “I’m glad it’s not being torn down since it’s part of Chicago’s baseball history and Hinsdale’s history,” said Robert Nienhouse, who sold the home to the Veeck family. Nienhouse bought the home in 2000. He updated the exterior, while changing the original room layout to a degree with renovation of the kitchen and bathrooms. Five owners spanned the decades between the 1964 departure of Grace Veeck, William, Sr.’s widow, and the re-acquisition by her descendants. The family was courteous enough to give the Chicago Baseball Museum a tour of the property, empty except for historic photos of the Veeck family way back that stoke the wayback images of life in the main house and adjoining apartment for then-newlyweds Bill Veeck and first wife Eleanor. Original steam radiators still line both floors of the main home, painted exclusively in white in the interior, too. In the tour, a description of a past affluent world of nearly a century ago came alive. Here was a separate bathroom for the servants, there was the main dining room in which breakfast and lunch were served on one table off to the side, and dinner on another, standard-sized main table. And, yes, wear that suit coat to dinner, please. The main house was William L. Veeck, Sr.’s after-hours refuge, after making the long round trip in his big luxury car via Ogden Avenue in the pre-expressway era to either Wrigley Field for games or the Wrigley Building downtown, then the site of the Cubs’ offices. William and Grace Veeck purchased the home in 1915, a year after their son’s birth in Chicago. An innovator who stoked the Cubs’ on-and off-the-field success to close the 1920s and stretch all the way into the 1940s, the elder Veeck no doubt never turned off his brain at home or even on Saturday afternoons at the nearby Hinsdale Golf Club, for which he also served as president. His precocious son also mined his creativity at home. In his upstairs bedroom leading out to a balcony, he nursed his own dreams such as foliage on the Wrigley Field walls years before he surprised the installation of the trademark ivy in 1937. After he married in 1935, Bill Veeck moved a few feet away into a second-floor apartment, which he expanded, that had been converted from servants’ quarters in the coach house. On game days, young Veeck hopped in the car with his father to Wrigley Field. Everything he accomplished in baseball flowed from these early experiences. He witnessed multiple Cubs forays into the World Series and wild rallies in the 1932 pennant stretch, capped by a Kiki Cuyler walk-off homer, which prompted the father-son Veecks to leap the box-seat railing to join in the celebration. 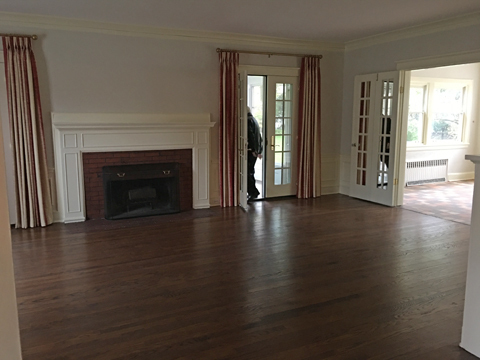 An interior room and fireplace in the main home. In an early 20th century layout, every room had its specific purpose. In 1933, William L. Veeck, Sr. was laid out here for his wake. The Veecks also witnessed the near-comic byplay surrounding Babe Ruth’s “called shot” in the 1932 World Series. 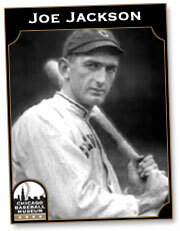 Ruth happily dodged fruit and other objects thrown from the old left-field bleachers pre-game, then with gestures and a titanic homer off Charlie Root gave it back to the needling Cubs dugout with compounded interest in the most myth-generating event in the game’s history. The Hinsdale home was quiet by comparison – until hosting an unfortunate ceremony that changed Cubs history for the worse. Just a few weeks after he endorsed interleague games as an attendance boost in the Great Depression near the end of the 1933 season, William L. Veeck, Sr. began suffering from a high fever and other flu-like symptoms. His doctor prescribed a tonic for him. But when he didn’t improve, the physician tested his blood and found a high level of white corpuscles. Veeck entered St. Luke’s Hospital in Chicago on September 29, 1933, and he died in his sleep in the morning of October 5 at age 56. The cause of death was leukemia. The Veeck family has an extensive photo and memorabilia archive. 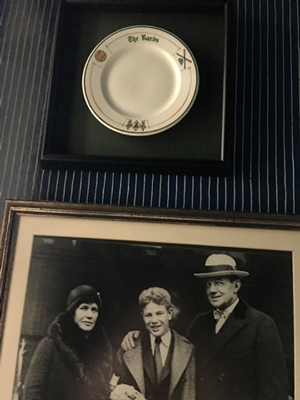 Here is a photo of William and Grace Veeck with son Bill. Veeck’s sudden, early death may have been the most catastrophic event in Cubs history – greater than the bungling of Greg Maddux’s contract to which he had agreed, the trade of Lou Brock or the Bartman game. The loss of the president, respected throughout the game, deprived the team of a hands-on, activist chief executive with ownership power. Unable to “find another Bill Veeck,” owner Phil Wrigley appointed himself president with disastrous effects for decades going forward due to his baseball-ignorant personality. Had the elder Veeck lived, say, another decade, he likely would have groomed his son with Wrigley’s approval to take over the Cubs. In the 1960s, Bill Veeck desired to claim his ancestral perch by buying the Cubs. But Wrigley – who liked Veeck No. 2 – vowed to keep the team until his own death. Within a few days of the elder Veeck’s death, the family received more than 500 telegrams of condolence and more than 400 floral arrangements. The funeral service was held at the Hinsdale home, conducted by the rector of the local Grace Episcopal Church, of which Veeck was a parishioner. The Chicago Evening American reported that “every member of the Cubs’ official family was present” as well as players from the White Sox. Veeck’s pallbearers included Cubs Vice President John Seys and five other “old neighbors.” One was longtime friend George Dreher, with whom Veeck had regularly played bridge and golf. In addition to roaming the links at the Hinsdale club, Veeck especially the golf course while at William Wrigley’s Catalina Island estate off the coast of California. Andy Frain and his blue-coated ushers lined up as a guard of honor on both sides of the sidewalk, and between them the pallbearers carried the casket. 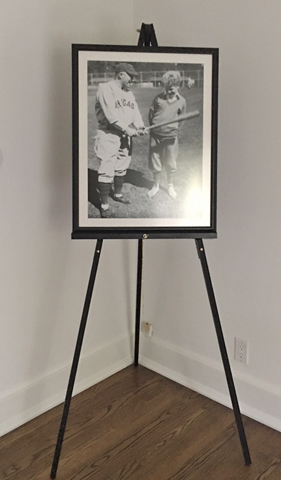 A photo of Cubs manager Joe McCarthy with a young Bill Veeck is displayed in Veeck’s childhood bedroom. The home also was the site of another landmark event in Chicago baseball history. On Thanksgiving 1958, Bill Veeck discussed with his mother his return to Chicago baseball as 54 percent owner of the White Sox, having purchased Dorothy Comiskey Rigney’s share of the team. He then went down the street to see Rigney’s brother, Chuck Comiskey, to tell him he was now his boss. Chuck Comiskey had unsuccessfully tried to buy his sister’s share. He retained his 46 percent share for the next few years. Going forward, some additional memories, albeit much more low-key, should be made by the next owner of the Veeck home, preserved for the future by history-loving family members.